Inspired by the animated alarm clocks of 1950’s cartoons, the Sprout Table Clock resembles a classic timepiece with a twist. 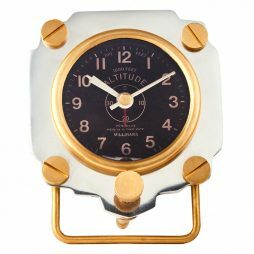 A fusion of solid aluminum and brass, the piece features a vintage 1940s clock dial sporting black steel hands behind convex glass crystal and oversize knobs borrowed from old office machines. 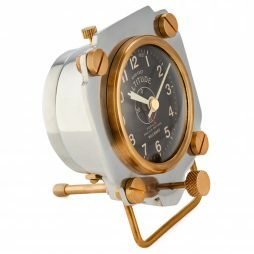 Sternreiter is pleased to present a collection of mechanical, spring-wound alarm clocks. These traditional pieces are all metal, with a high-quality mechanism. The loud alarm will wake even the deepest sleeper. 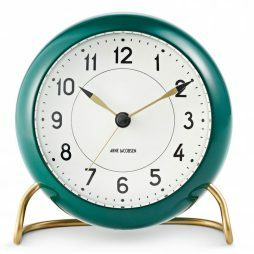 The “Color Series” models are part of a new collection of these fine clocks available in bold new colors. Easy to use, easy to set, fun to own! 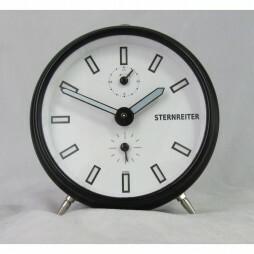 The Sternreiter alarm clocks are sought after worldwide for their quality mechanisms. Most clockmakers stopped using these quality materials 50 years ago because it was too expensive in a competitive market. 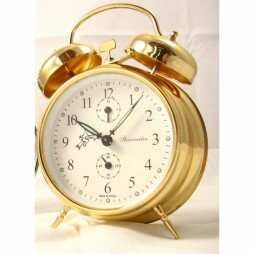 Sternreiter alarm clocks are inexpensive and can be maintained and passed on to your grandchildren. This Braun radio controlled weather station measures 3.5 x 5.2 x 1.9 inches. The accompanying sensor is 2.4 sq x 1 inches. 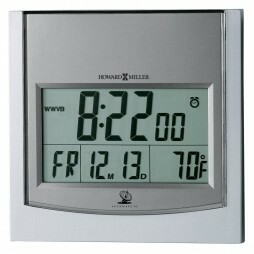 The clock has a superior reverse LCD display and has two mode buttons for a unique user customization. 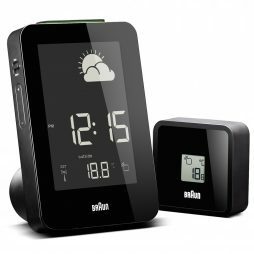 The user can press the mode buttons to toggle between time, alarm time, indoor and outdoor temperature and humidity at both the middle and bottom levels of the display. The top of the display is fixed and shows an animated weather forecast for the next 12 -24 hours. An outdoor sensor is included which links directly to the main weather station. The outdoor sensor has its own display that shows the outdoor temperature and humidity. The clock has a memory function which shows the maximum and minimum temperature records for the past 24 hours. 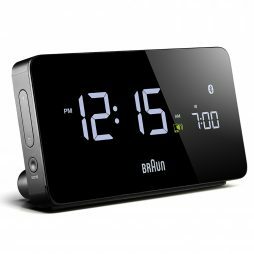 The clock has a quick set function for easy use and can be set to 12 or 24 hour mode. Simple, compact and elegant describes the Rhythm Sunrise Alarm Clock. Easy to read Arabic numerals and battery-powered movement. Never struggle to read the alarm clock in the middle of the night again. The Rhythm Nightbright LED alarm clock features a bright LED light, so you'll always know what time it is. Be thankful to wake up another “Joyful Morning”. Keep this alarm model near your bed side to awake to one of 4 Hymns; including Amazing Grace, Jesus Loves me and more. Clock is battery quartz operated. Gift yourself this beautiful and elegant Double Bell Mechanical Alarm Clock ? Orange by Sternreiter. Made in Serbia, this clock operates on mechanical brass movement with solid brass plates, brass gears, and steel shafts and pivots. 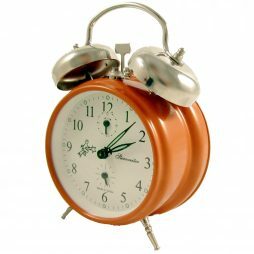 Adorning a bright orange color, this clock features loud alarm bells that can wake up even the deepest sleepers and requires daily winding to maintain the time and loud alarm. The dial bears easy-to-read Arabic numerals and glow in the dark hour markers and hands along with offset seconds and alarm dials. 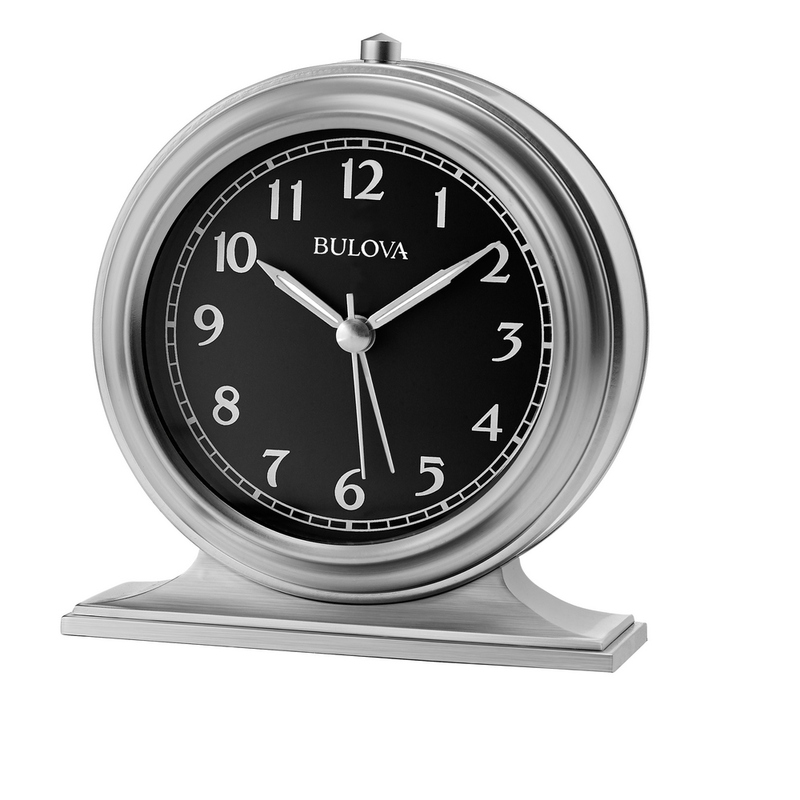 This clock will look perfect on any table or on the side of a bed. 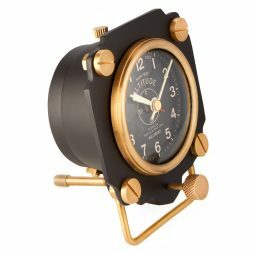 Add a classic piece to the decor of your house in the form of this Contemporary Design Mechanical Alarm Clock by Sternreiter. 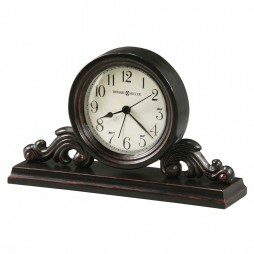 Made in Europe, this beautiful clock adorns a sleek design in a dashing black color. 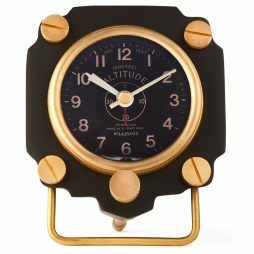 Running on a mechanical brass movement that features solid brass plates, brass gears, and steel shafts and pivots, this clock has illuminated hands and numbers. This clock has a loud alarm bell, which can wake you even from the deepest sleeps! The dial is a simple black and white one which features offset seconds and alarm dials as well. This clock also has a soft ticking sound. 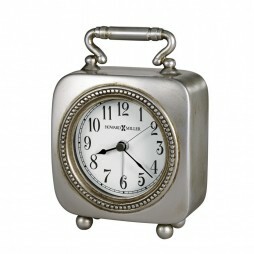 Stylize your home with this Collegiate Metal Alarm Clock which is not just designer, but functional at the same time. Featuring Snooze button, Lighted dial on demand, Ascending four beep alarm, Sweep second hand (no-ticking). The clock possesses an intelligent design, which helps you see the time, no matter if its day or night, darkness or light. Love baseball? Could there be a better way to start the day – Check out the Baseball Alarm Clock. 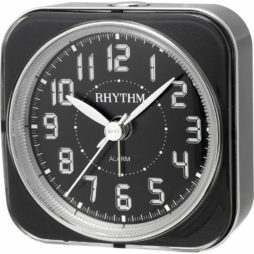 Crafted from ABS plastic, this clock is a bestseller from the house of Rhythm Clocks. It is a classic alarm clock that plays four different melodies as the alarm goes off. So, for a musical, pumped up mornings, this one is an ideal timepiece. Taking care of your convenience, this quartz battery-operated clock comes with a Volume Control feature and an ON/OFF Switch so you can keep off in comfort during the weekends. It has a classy design and a spectacular grey finish. Add this to your room now! A beautifully unique timepiece, the Bishop Metal and Wood Alarm clock is constructed of hardwoods and veneers in a worn black finish, with red undertones. The aged, off-white dial features aged black Arabic numerals and black hands, protected by a convex glass crystal. 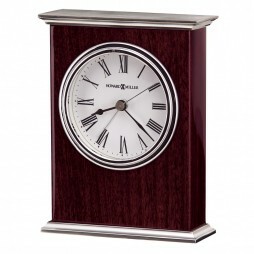 The clock is centered on a felt bottomed base and held up by two detailed wooden supports. 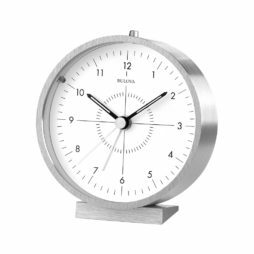 Clean lines, a beveled lightly arched top and brushed and polished aluminum base add distinction to the Tribeca Battery Alarm Clock. This timepiece features a white dial with a polished silver bezel, black Roman numerals and luminous insets on the black hour and minute hands. The felt bottom protects your furniture. The angular shape of the Paramount Glass Alarm Clock give it a unique style. 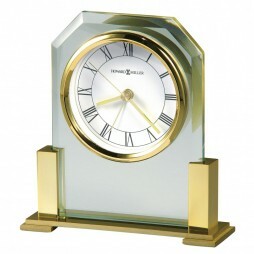 The beveled glass rests on a polish brass-finished base. The crisp white dial features black Roman numerals with polished brass-finished hands (with luminous insets on the hour and minute hands) accented by a polished brass-finished bezel. A brass plate is included for personalization. 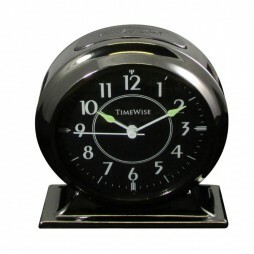 The modern design with large 2″ numerals make the Techtime II-Radio Controlled Clock easy to read. 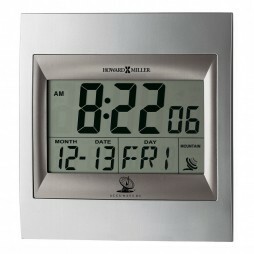 The LCD display displays the time, with a selectable 12 or 24 hour time format. 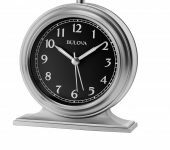 This two-tone titanium and satin silver alarm clock also displays the day of the week, month and date. It can be wall mounted or displayed on a flat surface using the folding easel stand. Radio controlled, battery operated movement. Its’ beautiful style makes a versatile addition to any bookcase, desk, nightstand, or tabletop. 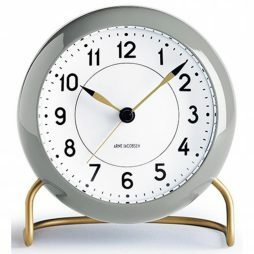 Sleek and contemporary, the Techtime I-Radio Controlled Clock features large 1 1/4″ numerals to display the time, with selectable 12 or 24 hour time format. It displays the day of the week, month, date and temperature and can be wall mounted or placed on a flat surface using the folding easel stand. Radio controlled, battery operated movement. The beautiful two-tone titanium and satin silver finish will add sophistication to any room! Make your guests happy by decorating your guest room with the contemporary and stylish Howard Miller Techtime III- Radio Controlled Clock. 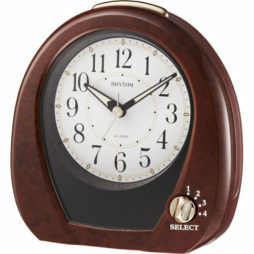 It?s a two-tone satin silver LCD display alarm clock with Americana Cherry finished wood accents. Large 2″ numerals display the time, with selectable 12 or 24 hr. time format. 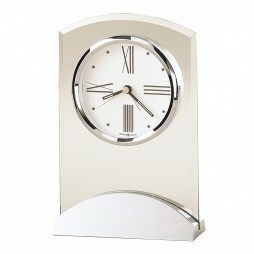 made of high quality material, clock with digital print looks appealing. 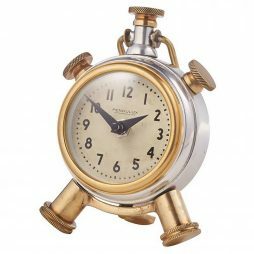 Artistically crafted, the Howard Miller Chronometer Quartz Alarm Clock – Nautical Decor makes for an exciting dcor accessory. 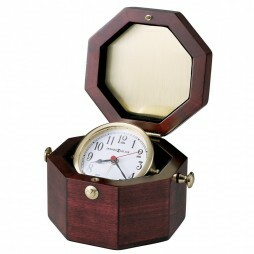 Unique, high polished cherry gloss finished octagon hardwood chest to display a solid brass captains alarm clock gimbaled to swivel to the angle of your choice. White, Arabic numeral face features a convex glass crystal, and black hour and minute hands with a red second hand. A solid brass catch keeps the box closed for safekeeping. Modern keepsake in your home, this quartz alarm clock is sure to add that “WOW” factor to any room with its classic design. Waking up on time can be a daily struggle. And most hard-working individuals know how much more difficult it becomes when you’re awoken by harsh sounds coming from your alarm clock. It only takes one shrill, overbearing ring to smack you into abrupt and unpleasant consciousness. There goes your good mood for the day. Make a change to start every day on the right foot. Wake up to the lovely sound of a brand new alarm clock! Here at Expressions of Time, we aim to offer our customers with perfect timepieces for their home, including the everyday alarm clock. We have a wide and varied collection of choices, ready to serve each and every customer. Wake up to classic ringing bells from a mechanical alarm clock. Emerge from bed while listening to a perfect pick-me-up song playing on your bedside alarm clock. Or find one with the loud volume you need to clear the sleep fog and boost you into action. 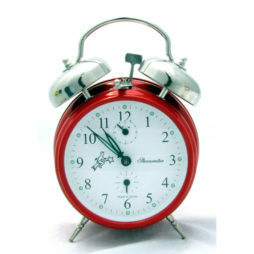 Whatever model and type of alarm clock you want, we have something in our inventory to suit your needs. 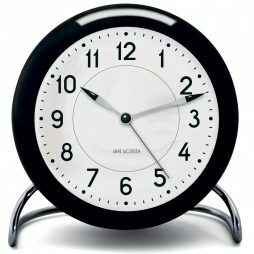 Shop ClockShops.com, and explore all of your options for creating the better sleeping and waking environment you deserve. Many find themselves using alarm clocks these days without even acknowledging where they derived from. Smartphones and laptops in today’s digital era take for granted the abilities of using alarms to wake us from sleep. Yet, they’ve come a long way from their strange yet fascinating origins. The alarm clock can be traced all the way back to the days of Plato. The ancient Greek philosopher used a large water clock, prepared to play sounds similar to a water organ. Set at night, it would then presumably be ready to awaken him for his morning lectures. Other notable alarm clocks had a variety of sounds during this time. Some included dropping pebbles on a gong, or even blowing makeshift trumpets through underwater bell-jars. From water clocks in Roman times to the striking clocks in the towers of China and Western Europe in the 14th century, different alarm methods have always had a place in our history. These many variations of the alarm clock demonstrate the lengths this contraption has gone through to establish our current model. And through those many trials and tribulations, alarm clocks have excelled and become a common necessity in modern times today. 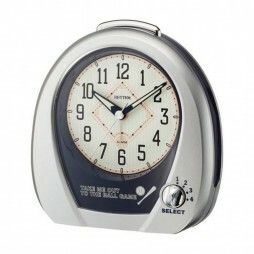 At ClockShops.com, we offer every alarm clock under the sun. For instance, the Sternreiter Mechanical Wind-Up Alarm Clock gives you the best of both worlds; a modern alarm with mid-century charm. 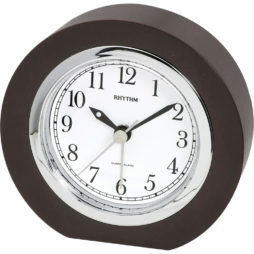 Its two ringing bells placed atop the clock face display the classic image of a bedside alarm clock. And its light ticking, rhythmic sound soothes you into a restful, deep sleep before waking for the new day at the ring of the bell. Or go for the Lite Night Bedside Alarm Clock. This model has many great features for such a small size. Its oversize hour markers and numerals, lighted at night, make for easy viewing for young and old alike. The beeping alarm is simple yet effective. However, this bedside alarm clock also comes with a snooze button, to tempt you so greatly back into a blissful rest. Looking for something digital or modern? We also have digital alarms ready to play your favorite tunes first thing in the morning. 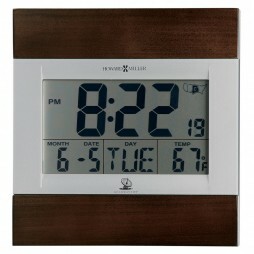 Take the Howard Miller Techtime I Radio-Controlled Clock, with its vibrant LCD display. Its large, easy-to-see numbers can be seen from across a great distance, while its volume can reach the level you need to rouse you. Loud alarm clocks can be hard to find, but this item ensures you’ll be raring to go, on time, every time. 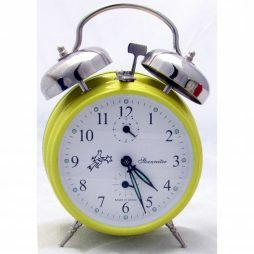 Find all your bedside alarm clocks, wind-up alarm clocks and even loud volume alarm clocks right here at Expressions of Time. We’re your one-stop shop for all things related to time, and we’re happy to offer you any variation of alarm you need. We all have those days where sleeping in is the only thing on our minds. When the thought of rising from our comfortable beds and fulfilling our duties for the day seems impossible. But in our efforts to do good work, we rise, time and time again. Help yourself conduct a hard day’s work after waking with an alarm clock that won’t have you scrambling to get ready and out the door. 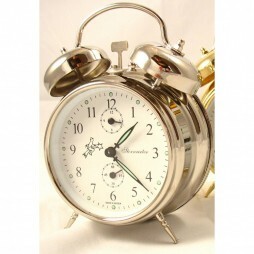 We have an impressive variety of alarm clocks, from the best, most reliable brands on the market. Choose from Howard Miller, Sternreiter, Bulova or Timewise models that won’t leave you disappointed. 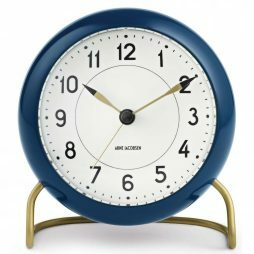 You can even find fun and relatable clocks for everyone’s inner child, like our baseball and nautical-themed bedside alarm clocks. 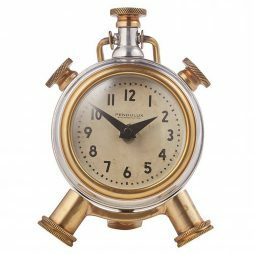 There’s an alarm clock for everyone available here at ClockShops.com, and we mean to keep it that way – always. Don’t let groggy morning wake-up calls ruin your day. Don’t stress yourself out running around your house in a panic after sleeping through your mediocre alarm. Invest in yourself by investing in your time – literally. 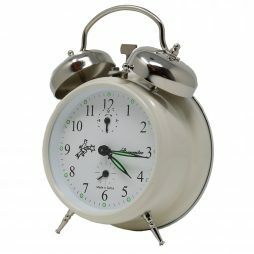 Clockshops.com offers a wide variety of simple yet high-quality alarm clocks, which can be securely ordered through our online ordering system. We give our loyal customers free shipping and a reasonable return policy, making our alarm clocks not only affordable but convenient. So leave your old alarm clock behind like a bad nightmare. Shop through our multitude of items and secure your future with a longstanding, reliable alarm clock to start your day off right. After all, you can’t truly make a success of your life if you don’t even wake up in time to experience and enjoy it.